82% of students who take a gap year, first of all, want to rest and take a step back from the academic field. So, if you are reading this article right now, you either have already enjoyed your time free from papers and research, or dismissed this opportunity not to waste months on understanding who you are and what you want to do with your life. Anyway, all your decisions have led you to this point when you need to grasp the difference between the use of bibliography and literature review (yeah, students often get them confused while writing academic assignments). You have to get your bearings around these two notions in order not to mix them up and submit polished, flawless papers with all its parts completed correctly. Now let’s see what the fuss is all about. The annotated bibliography is compiled to give a reader a review of all the sources used in an academic piece and their relevance to the topic together with their credibility. In the meanwhile, the literature review has to provide a brief summary of the subject researched in the paper by mentioning and exploring the main written works in the field. In the bibliography, all the articles and books are arranged as a list according to the alphabetical order whereas the literature review has a structure of a regular text with an introduction, paragraphs and conclusion. Annotated bibliography mentions the source only once giving a small description (100-200 words) of its importance. The literature review can repeat the same works several times if it’s required. In the list, each scientific article or journal has to be analyzed separately while the review presents a number of resources and sorts out whether they disagree or agree. As you can see, these 2 elements are completely different and when you know the distinctive features of each one, it’s actually difficult to mix them up. But identifying details don’t end at this point. 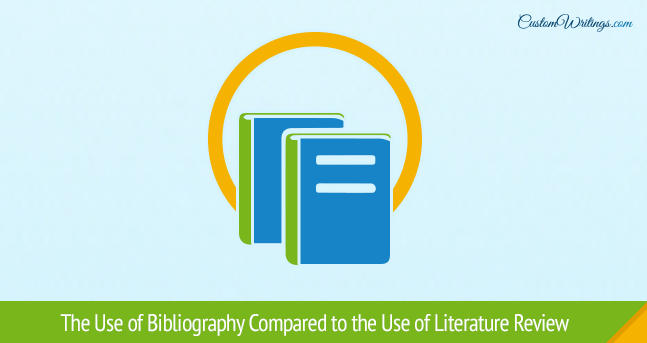 While creating an annotated bibliography, it is significant to take into consideration that its single source contains a description together with a citation preceding it. A citation always has to be formatted following the regulations of a certain referencing style (APA, MLA, etc.). A literature review, in its turn, abides by the rules of the text and in-text citation formatting. All in all, the annotated bibliography is a list of works mentioned in the academic paper organized in alphabetical order that gives a brief account of why they are relevant to the research. The literature review, on the other hand, touches upon the topic under research and specifies the major contributions published throughout some period. Bookmark our article with these definitions and characteristic features to keep it handy whenever you need to find your way around this difference again.